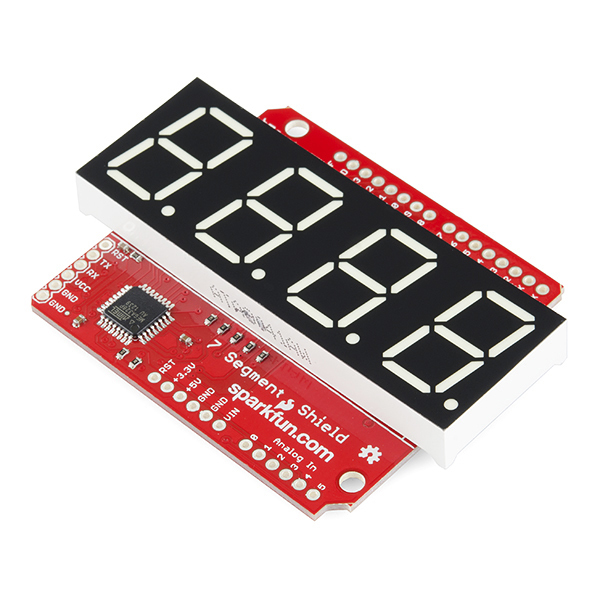 We love 7-segment displays and we know you do too, so we have made the easiest (arguably) to use medium for you to get up and running and use! 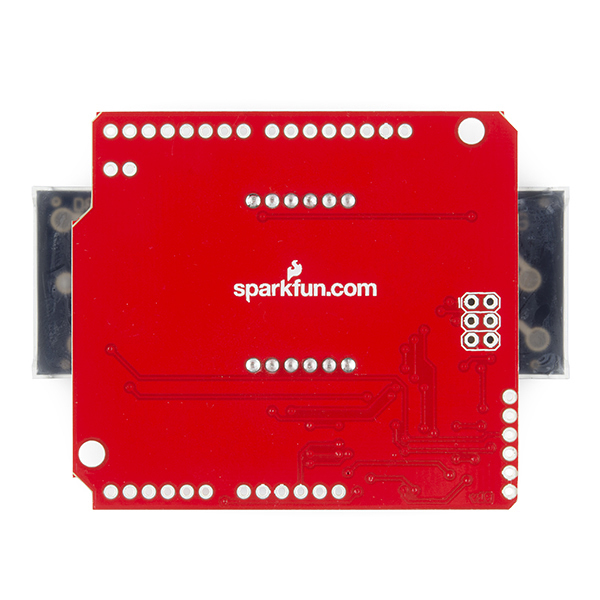 This red SparkFun OpenSegment Shield was specifically designed to run on top of most Arduino Uno compatible boards, all you need to do is attach headers to the shield and snap it in, no bread boards required. 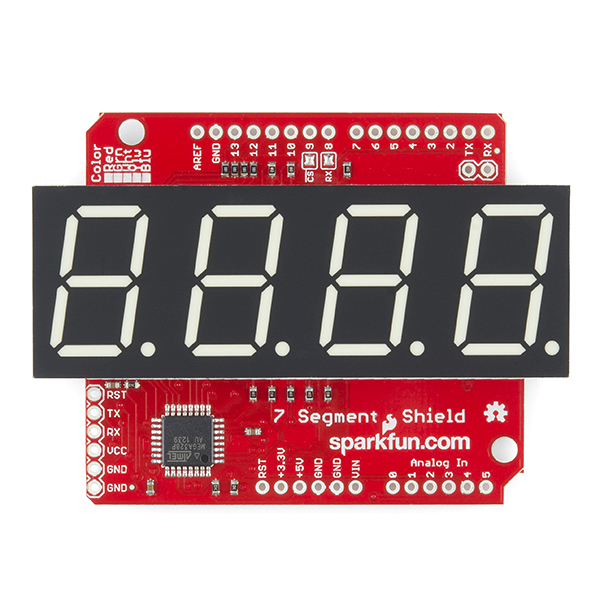 The OpenSegment Shield still combines a classic 4-digit 7-segment display and an ATMega328 microcontroller allowing you to control every segment individually using only a few serial lines. 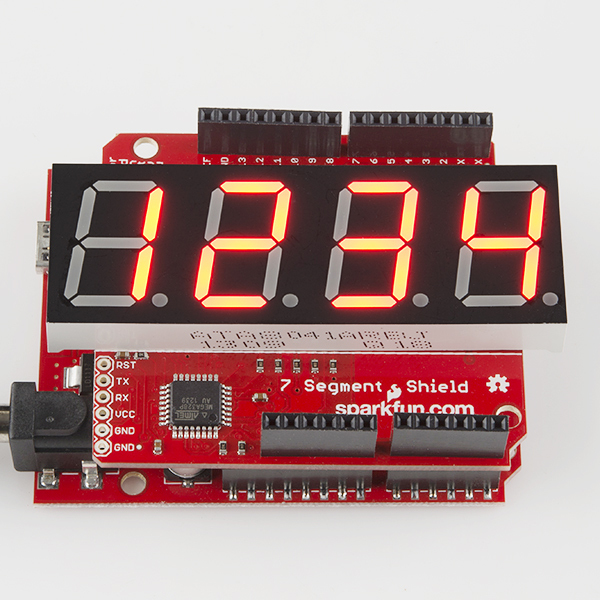 Just like our other 7-segment boards, the OpenSegment Shield can be controlled in one of three ways: Serial TTL communication, SPI serial communication or I2C serial. 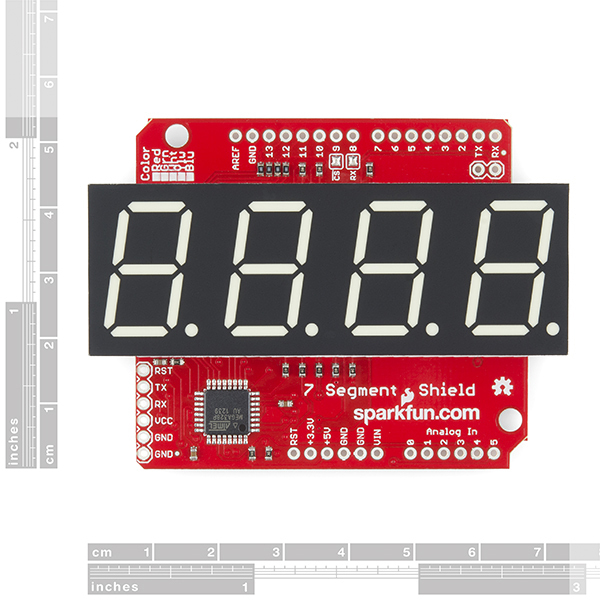 This shield is very similar to our other OpenSegment Displays, the biggest benefit to this board is its ease of use thanks to the Arduino Uno form factor. the board works fine for me. i have two of them. but getting the libraries set up is a bit of a challenge for a noob. we are building halloween controllers and i bought three different boards and this was the best solution for us. the transport works (stop/play/advance to another track); and the volume (lr/). that's all we needed. I can't get this shield to work. The serial examples result in the center segments and decimal points being very bright, with the other segments being very dim. There is slight flickering on the dimmer segments. Here is an image of the issue: http://i.imgur.com/sv3yXCX.jpg. Does anybdy know how to fix this issue? I see you made this comment 11 months ago. Did you solve your issue? I'm planning to buy this board but your comment makes me hesitate. Was the board damaged? Was it a software issue?